Each year veteran and emerging regional poets are invited by Art on the Prairie to showcase their work in Poet’s Corner. This year we have artists from Ames, Beaver, Chariton, Des Moines, Earlham, Ft. Dodge, Indianola, Manning, Perry, Urbandale, West Des Moines and Winterset. 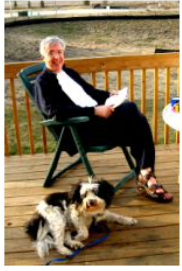 ​Lee Enslow is a member of the Iowa Poetry Association and a founding member of Third Stanza Poets of Ames, Iowa. He currently has a catalog of six chapbooks with his publishing company, Treedom Press. He writes on diverse topics but primarily nature-writing. He lives in Beaver, Iowa, with his wife and numerous stray cats. when they hear me coming. on the ends of prayer rugs. New Portraits is the seventh book of poems by Elaine Erickson. Her award-winning poems have appeared in journals such as The Briar Cliff Review, The Maryland Poetry Review, and Lyrical Iowa. In addition to composing poems, Erickson composes music. She has written five operas, and a variety of chamber, orchestral, and choral works. She has received several awards for her compositions from The National League of American Pen Women. She lives with her cat, Katrina, in Des Moines, Iowa. a miracle of wild rose. You are a dream beginning at dawn. your dress for a ballerina quivers. or keep you in the palm of my hand? ​Marilyn Baszczynski, originally from Ontario, Canada, teaches and tutors French in Central Iowa. Writing since childhood and largely inspired by living in the country, she weaves life's journeys and detours into her poems. She has won awards for her poetry in NFSPS and Iowa Poetry Association contests. Gyuri, a work based on the experiences of Hungarian refugees appears in the Geste Series published in spring 2015 by Whistling Shade Publications. Her poetry has appeared in The Aurorean, Lyrical Iowa, Tipton Poetry Journal, Midwest Poetry Review, Sweet Annie & Sweet Pea Review and online at Mused - the BellaOnline Literary Review, Loch Raven Review and Poetry.com. Marilyn is currently President of the Iowa Poetry Association. I walk along rue Bellechasse to the musée d’Orsay. drifting alone in waves of natives and foreigners. I head straight to upper level room 35 to see you again, Vincent. through thick daubs of color in landscapes and in sky. stubborn, hot-headed and discouraged in the end. ​Shelly Reed Thieman feels deep responsibility for capturing and sharing the beautiful and burlesque range of human emotion and experience through poetry. She is an Iowa native and believes poetry one of her co-religions; she is a disciple of vivid and unexpected imagery, a discoverer of glamour in the unglamorous, a mistress of montage. like fat oranges waiting to be peeled. buzzed, benevolent at holiday parties. and snow pursues, shaking white fists. dreaming in the softened armchair. when it moves in it’s a hell of a thing. ​Mark Widrlechner has lived in Ames for more than 30 years where he worked as a horticulturist and is now an affiliate faculty member at Iowa State University. About four years ago, shortly before his retirement, he unexpectedly began to write poetry after a very long hiatus. Many of these verses are inspired by the natural world, the Iowa landscape and travels further afield. His worldview is rather totemic, and he often incorporates animal spirits into his verses. 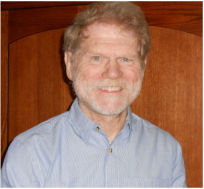 Mark has assembled two collections of poetry, "This Wildest Year" and "A Short Geography of Remembrance," that are available as e-books accessible through ISU's Parks Library at http://lib.dr.iastate.edu/ebooks/. And, in the spring od 2014, he completed a collection of 145 new poems inspired by the "Tao Te Ching" and the "I Ching." driven by the primal strength of the Oldest Tree. No barrier can confine them. growing fast, multiplying into green thickets that surround us. We cannot escape them nor do we want to. We become the bees that service her blossoms. We become the robins that feast on her fruits. ​Lori Shannon has been writing poetry since she was a child. She particularly enjoys writing sonnets and humorous verse. She has appeared continuously in the Iowa Poetry Association's publication Lyrical Iowa since 1989 and has placed on or won several out-of state-contests over the years. Her works have appeared in Capper's, Ideals and on Faithwriters.com. Two of her works have been set to music by singer Brian Joens. A quilt with striking scenes of deft design. For impact of each color, shape, and line. And fields of wild sienna just for fun. And stitches milkweed silk to beautify. And with a wink at Winter falls asleep. Dennis Maulsby is a retired bank president living in Ames, Iowa. His poems and short stories have appeared in The North American Review, Passager, The Hawaii Pacific Review, The Briarcliff Review, and on National Public Radio's Themes & Variations. His book of Vietnam War poetry, Remembering Willie won silver medal book awards from two national veterans organizations. His second book of poetry, Frissons, a collection of haiku was published in 2012. Prolific Press released a third book of his poetry, Near Death/Near Life in May of 2015. A book of linked short stories is scheduled for publication in 2016. Maulsby is a past president of the Iowa Poetry Association. More about Dennis at www.dennismaulsby.com. fire my bone and flesh to ash. an example of primitive man. a traveler in sun and wind. My particles will spread to all the nations. And, make their sunsets red. on Terra Del Fuego, Addis Ababa, Ulan Bator . . .
to be a log burning in your fireplace. my image reflected in a toothy smile. to kite the roiling winds between suns. Published in the 2003 edition of Lyrical Iowa. Maggie Westvold is an Ames area native and writer of poetry and memoir. She has been published for 12 consecutive years in Lyrical Iowa, the annual anthology of the Iowa Poetry Association; and in 50 Haikus in 2013. 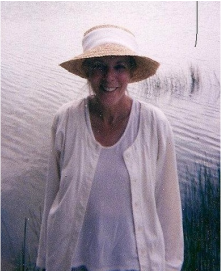 Her poem 'Singing Tomma Lou' was recognized in 2007 with an honorable mention from the National Federation of State Poetry Societies. She has, for seven years, been one of the featured poets at Third Stanza's 11 Days of Global Unity Poetry Reading in Ames, Iowa. This will be her fourth year to read in the 'Poets' Corner' as part of Perry, IA's Art On The Prairie festival. Maggie lives in Ames, IA, with husband Steve. 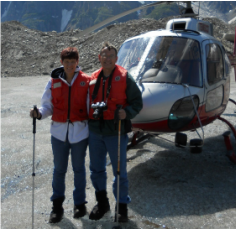 They have a daughter, a son, six awesome grandkids, and they enjoy retirement and the 'better kind of busy' that offers. I have your pumpkin gene, Mom. at her toothless smile, all puckery. Talk to the man whose inside. In the Milky Way stars? We’ll pass the planets one by one. Before we get to the sun. There’s just one thing I need to know. Is there room for three people? Now my Mom wants to go. ​After earning degrees in Theatre and English from Drake University, Heather Clark worked as a book store clerk and a science-actor for educational programs. She then transitioned to accounting and administrative work. Heather is torn between urban and rural life, but has found a happy medium in moving back to her small town and commuting to the nonprofit she works for in downtown Des Moines. Her poems range from remeberences of loved ones to social and economical observations. 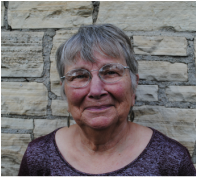 She is a member of the Iowa Poetry Association and facilitates the Winterset Writers' Workshop at the Winterset Public Library. to the south of us. and the earth stops moving. that we’ve been feeding on. ​Staci Harper Bennett is a native of Des Moines. She graduated from Iowa State University with a BA in English and from Drake University with an MBA. Staci is the author of three chapbooks- Soon is Not, Brittle Futures, and Thirty- and is currently working on a tongue-in-cheek chapbook about the joys of dating. In addition to writing poetry, Staci enjoys spending time with her pets and working at the Des Moines Art Center. ​In high school my English teacher, a nun, advised me to shorten my five-line stanzas. “Poem stanzas are four lines,” she said. As a Sister of Charity myself, later, a friend stopping in when I was away, left a note: “This must be your room. There’s a poem in the typewriter.” With a Sabbatical I earned my MFA at the Writer’s Workshop. Two poetry groups, Third Stanza in Ames and Omega in Des Moines, continue to nourish my writing. I'm working on my third book. Married, I live on an acreage in Boone County. 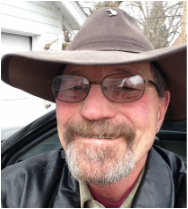 My poetry has been published in numerous small publications including "The Journal of Medical Literature" and has placed five times in the 'Lyrical Iowa's' 'adult general' category, winning that competition in 2008. I now serve as editor of the 'adult general' section of that publication and am therefore ineligible for awards therein. I also have a poem being published in "The Midwestern Review" in 2012. I was a featured poet at the Finch and Rose Society's '99 Counties' celebration of Iowa's birthday in 2009, my poetry was featured in a 2010 calendar published by the Iowa Natural Resources Commission, and my work has been displayed in numerous 'DART' busses in Des Moines. I published a book of poetry entitled 'Hard Papas' in 2013. I support my writing habit by teaching teachers-to-be at Simpson College. is a mirage to itself. ​After decades spent in various towns and cities west of the Mississippi, I returned to my hometown, Winterset, Iowa. In high school I started writing poetry, improved in college then entered the business world and misplaced poetry. Fortunately a few years ago I found it again. I think it was in the spring, either May or June. Ants were on the peonies; yellow iris were in bloom. It was a vibrant blue breezy morn. Ada was in the upstairs room making up the bed. Down in the basement John put a shotgun to his head. Ladies from the aid society were there 'fore noon. Hobbled down the stairs - set about their chore. Seemed but yesterday just now. They found her papa in the haymow. Rope 'round his neck - there he hung. Annie's heart burst again for her father. That horrid winter was the flu what kilt his wife and oldest daughter. And the faded man, her father, too. And the corroded cracker tin of crumbling letters from Clyde Earl. War discharged her awol lover in a flag draped coffin. Elaine remembered the bed of vomit when her mother died. The ladies called upon the sheriff. He told them stop their nonsense gossip. It was just an accident – too many headache pills. Elaine went to her aunt and uncle; labored in the textile mills. Her father left for California with the wealthy widow Emma Sue. Within two years came the news she had a headache. Funny - she died too. Was it the fit or did she show? To erase the blood reminders of the shotgun blast that day. They did as neighbors do. ​Rebecca Crum was born and raised along the Mississippi River in Wisconsin. She currently lives and works in Des Moines Iowa during the week and commutes to Northern Iowa to be with her family on during the weekends. Crum writes poetry and surreal short stories. She has been a featured poet at Art on the Prairie since 2012. “Tom Dooley, oh hang down your head, Tom Dooley.” He sounds just like The Kingston Trio. “He owes me a game,” I tell his girl. She smiles. We guess every murderer and every weapon a person could ever use to commit such a terrible crime. We discover room after room where unspeakable deeds have taken place. Without thinking I hum “Lemon Tree” by The Kingston Trio and then my brother joins in. Danelle Stamps is a permaculture farmer in Southern Iowa, a beekeeper, a mother, a poet, a dreamer, and a stargazer. Danelle's art photography has appeared online at Flyway: Journal of Writing & Environment and in the Portland Review. 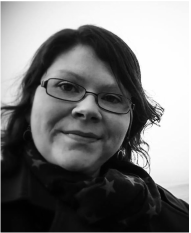 Her writing can be found at the Fifth Wednesday Review, fall 2014 issue and at Red River Review, August 2014, online. She blogs at The Stamps Family Farm.